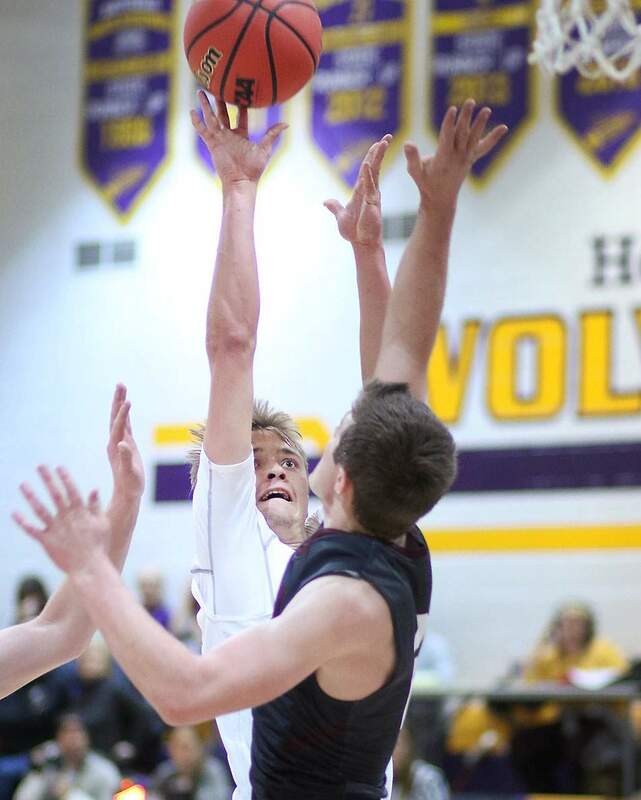 Bayfield’s Turner Kennedy rose to the occasion in a key 3A Intermountain League home rivalry game Tuesday against Alamosa. He scored a team-high 18 points. 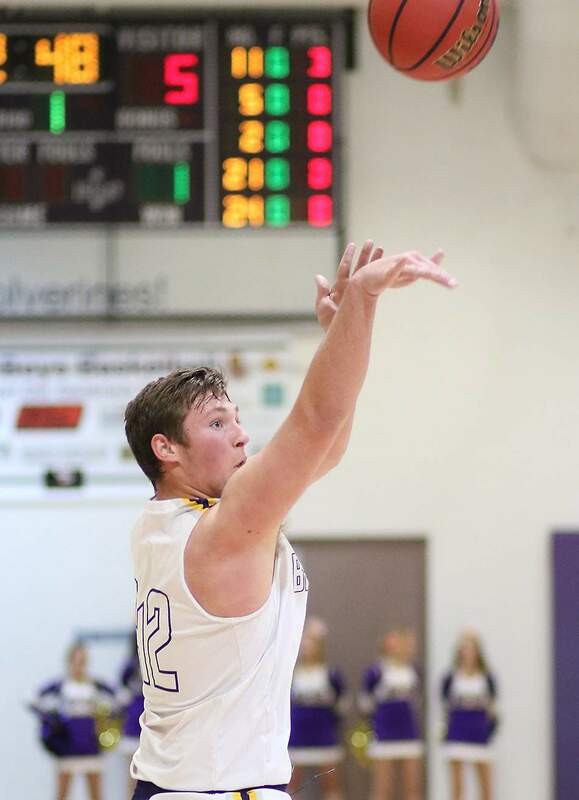 Hayden Farmer of Bayfield High School puts up a shot while playing the Mean Moose of Alamosa on Tuesday night at BHS. Keyon Prior of Bayfield High School puts up a shot while playing the Mean Moose of Alamosa on Tuesday night at BHS. Turner Kennedy of Bayfield High School puts up a shot while playing the Mean Moose of Alamosa on Tuesday night at BHS. 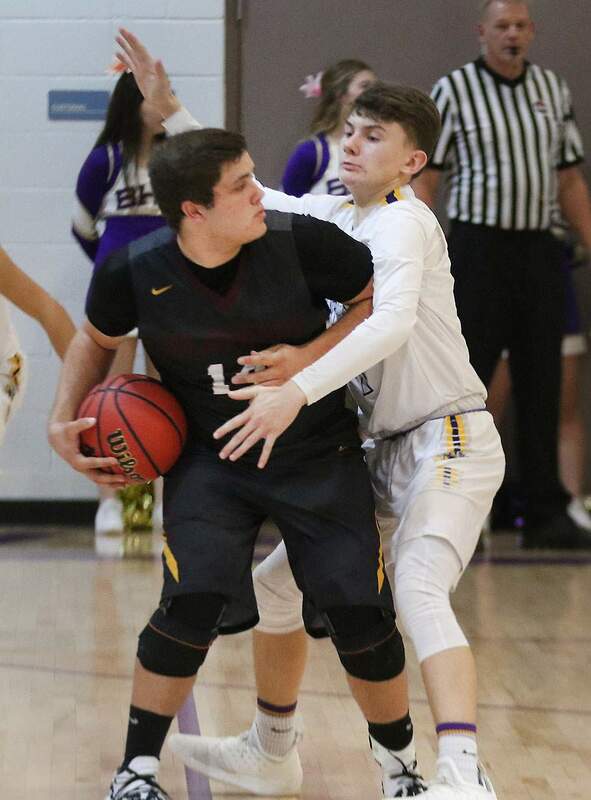 Matt McSweeney of Bayfield High School fights for a rebound while playing the Mean Moose of Alamosa on Tuesday night at BHS. 01-22-19- Durango- James Mottin of Bayfield High School plays tight defense against the Mean Moose of Alamosa on Tuesday night at BHS. 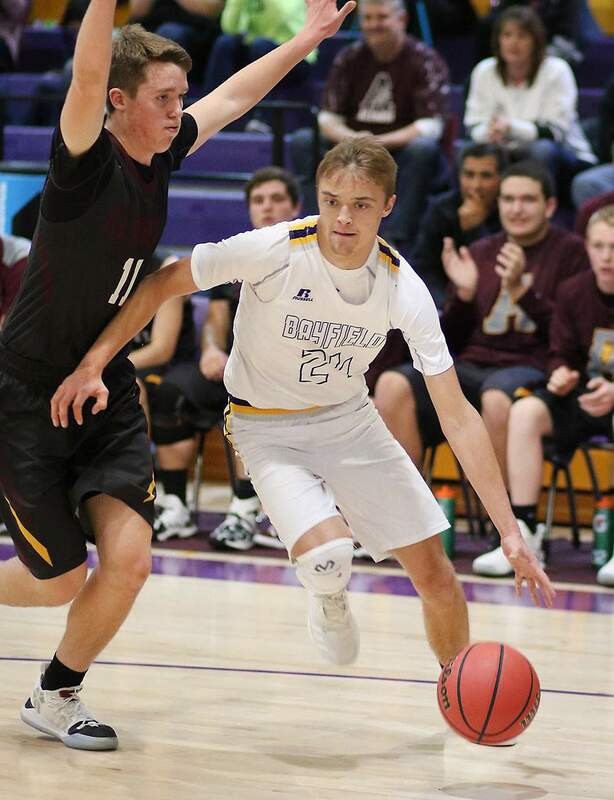 Hayden Farmer of Bayfield High School drives around a Mean Moose of Alamosa player on Tuesday night at BHS. 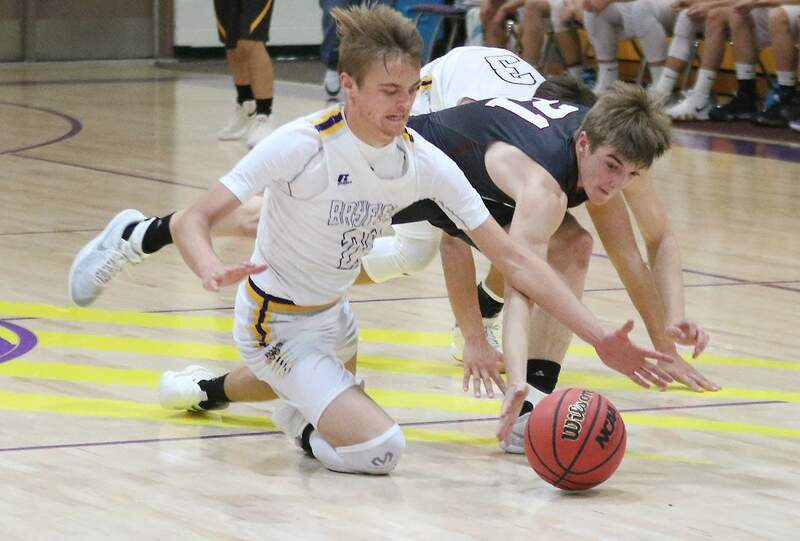 Hayden Farmer of Bayfield High School dives for a lose ball against the Mean Moose of Alamosa on Tuesday night at BHS. 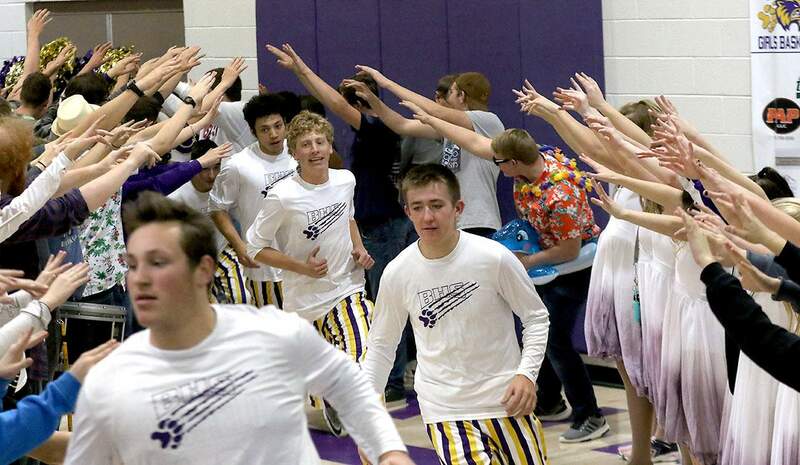 Bayfield High School players take to the floor before the start of the game against the Mean Moose of Alamosa on Tuesday night at BHS. 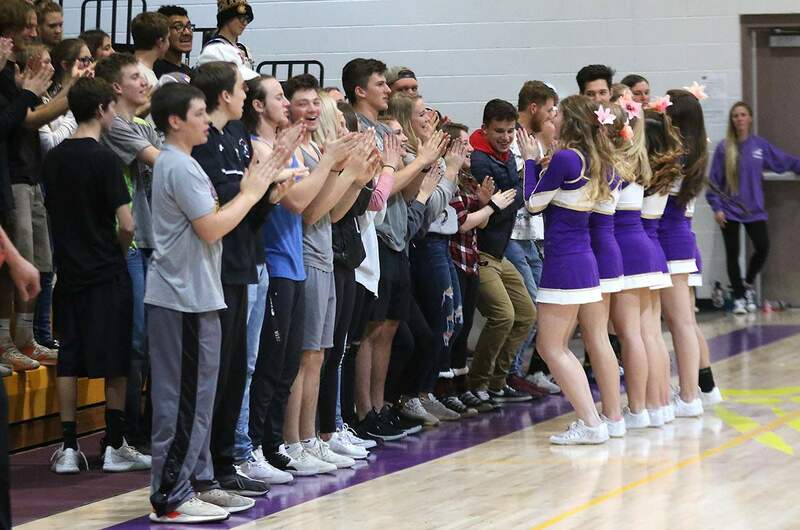 The Bayfield student section cheers on Tuesday night. 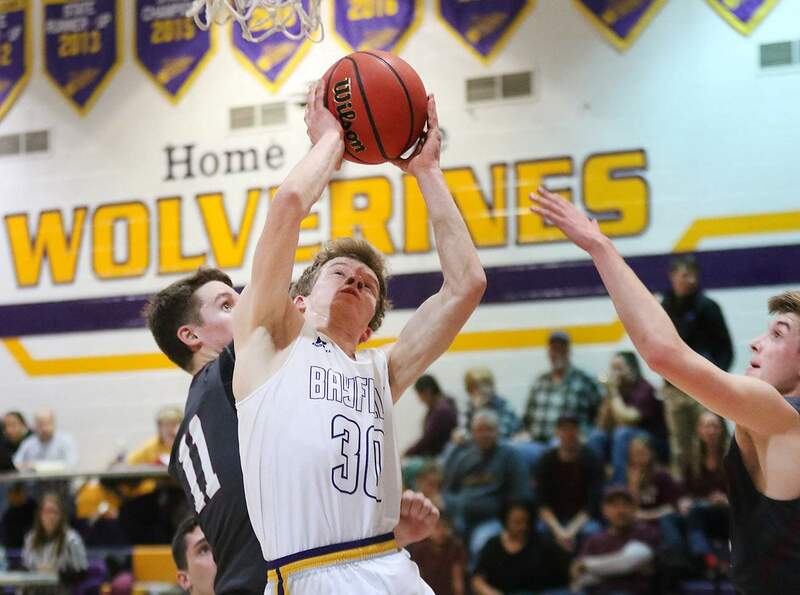 The Bayfield High School boys basketball team was up by two points with 1 minute, 13 seconds remaining against rival Alamosa on Tuesday night at Bayfield High School. Alamosa Mean Moose guard Brendan Crowther was at the free-throw line shooting two. He made both, but the referees called a technical foul on Alamosa for having too many men on the court. 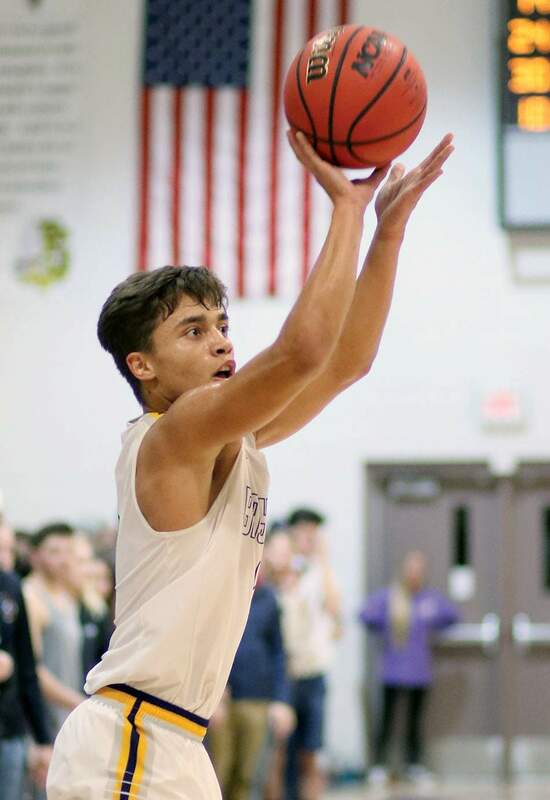 BHS made the most of its late free throws to hold on for a crucial 62-56 home win. It was Hayden Farmer, who scored 15 points in the game, who made the technical free throws after the costly Alamosa mishap. Alamosa (8-5, 3-1 3A Intermountain League) cut a 10-point deficit to two late in the game, but the technical foul was the game-changing play. Mean Moose head coach Brandon Brubacher thought his team did a good job of battling back. “We were in the middle of the substitution, and they threw the ball, and it is what it is,” Brubacher said. “It’s an unfortunate, for sure. 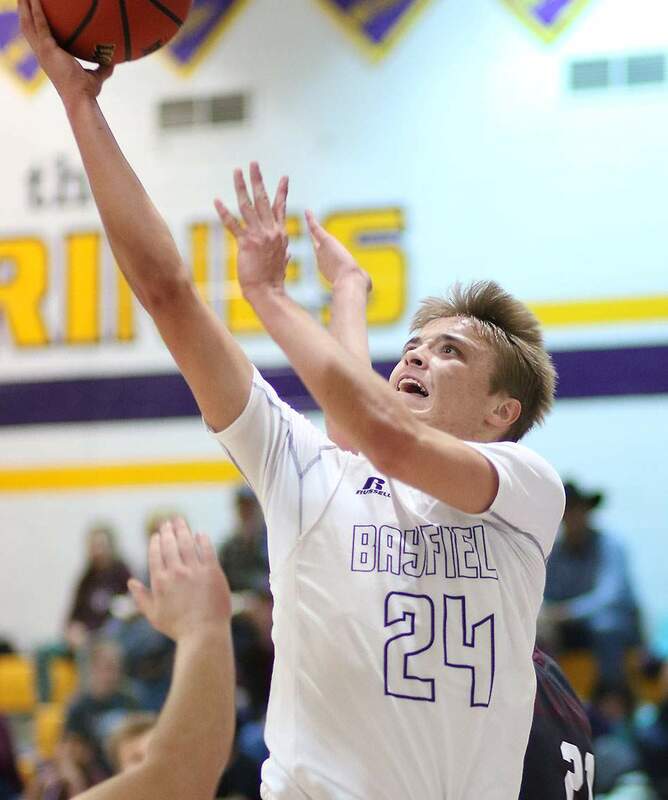 Bayfield (8-4, 3-0 IML) had four scorers in double-figures on the night, including Turner Kennedy, who tied a game-high 18-points. Three other players had 10 points or more. Ethan Morris added 13 while Keyon Prior finished wit 12. Hayden Farmer of Bayfield High School puts up a shot while playing the Mean Moose of Alamosa on Tuesday night at BHS. Farmer had 15 points, including a few key free throws down the stretch. BHS head coach Klint Chandler thought the physical play inside and contributions from across the roster were positive signs moving forward. Morris was able to get easy baskets and also got to the free-throw line six times in the game. The Wolverines went into the locker room up 29-21 at halftime and extended the lead to 41-31 by the end of the third quarter. 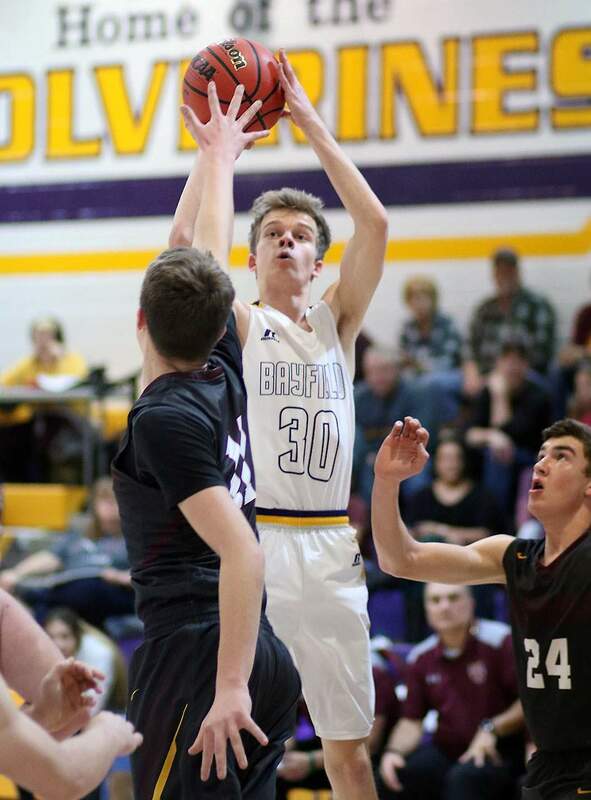 Alamosa outscored Bayfield 25-21 in the final quarter, and the Wolverines could have put the game away sooner if it weren’t for inconsistent free-throw shooting, where they went 13-of-26. 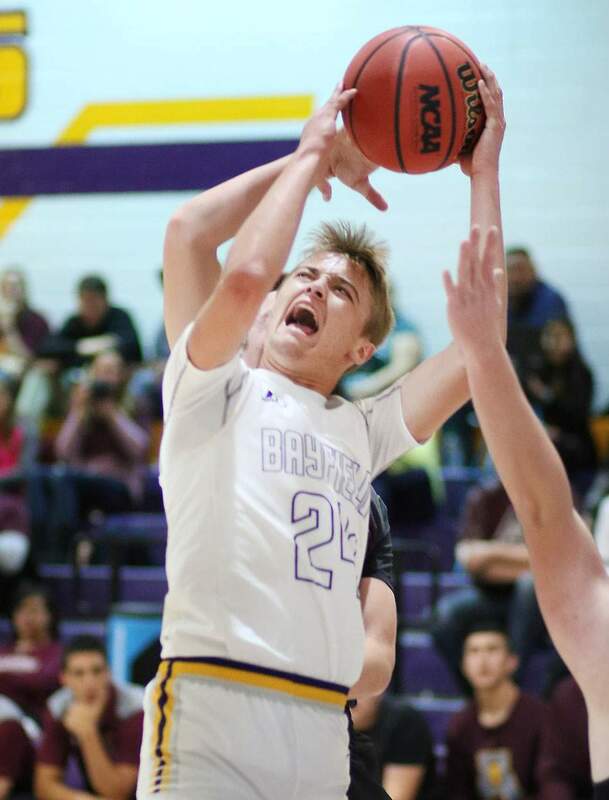 Ethan Morris of Bayfield High School hits a 3-point shot while playing the Mean Moose of Alamosa on Tuesday night at BHS. The Mean Moose climbed back into it through Chad Jackson, as he had nine of his 18 points in the fourth quarter, while Crowther had seven points in the frame, including a late 3-pointer. 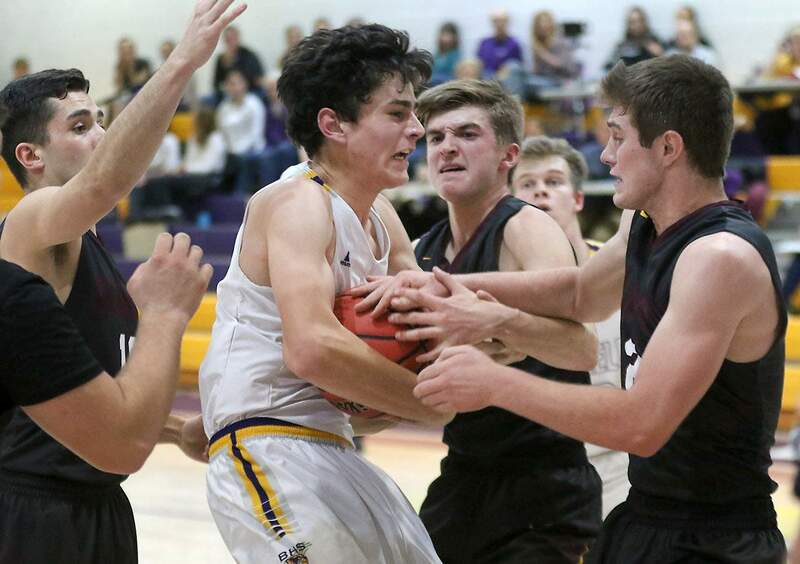 Bayfield will travel Friday to Pagosa Springs for another conference showdown. Tipoff is at 7 p.m. at Pagosa Springs High School. The trip to Alamosa looms Saturday.